Summer is fast approaching – and you know what that means!! 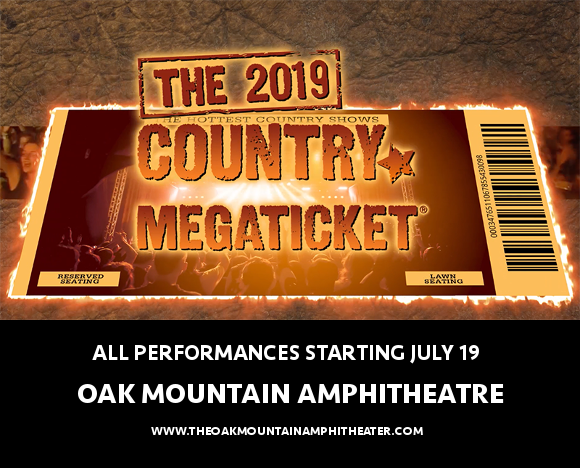 That’s right, it’s the return of the 2019 Country Megaticket, giving you access to every big country performance at the Oak Mountain Amphitheatre this year!! This year’s deal features Luke Bryan, Brad Paisley, and Thomas Rhett – each with their own spectacular special guests!! It’s an offer you simply can’t refuse. You’ll have to hurry though, as these tickets won’t last! It’s all kicking off on Thursday 18th July 2019!! Each year, venues around the US partner with the Country Megaticket to offer country fans the ultimate deal – the chance to see all their favourite bands at the venue of their choice, at one unbeatable price. It’s a no-brainer if you can’t decide which country shows to see this year!! Brad Paisley, July 19, with Chris Lane and Riley Green. Brad Paisley will be carrying on his relentless touring schedule into 2019, hot in the wake of his most recent single “Bucked Off,” with special support from Chris Lane and Riley Green. Luke Bryan will perform as part of the Sunset Repeat tour, featuring support from Cole Swindell and Jon Langston. As for Thomas Rhett, he’s performing as part of his Very Hot Summer Tour, accompanied by Dustin Lynch, Russell Dickerson and Rhett Akins. Are you ready for it?? Then grab your tickets now, while the opportunity lasts! !